Caron Paris Private Sale Event: Save 20%! Between the two of us Nicole and I have amassed a rather extensive collection of Caron, all of it absolutely gorgeous. If you’ve been dying to get your hands on a fluffy swansdown puff or a gorgeous powder or two, now’s the perfect opportunity! Diane was kind enough to contact me to extend a fabulous invitation to all my readers–a 20% off private sale running from December 1st through December 6th! That means 20% off all things Caron including puffs, powders, and compacts. You can place your pre-orders starting now so as to make sure she has the items in stock once the event begins, and they’ll be shipped out to you starting the 1st (or you can stop by in person of course). To place your order call the Caron boutique at 212-308-0270 and ask for Diane! What do I recommend purchasing? 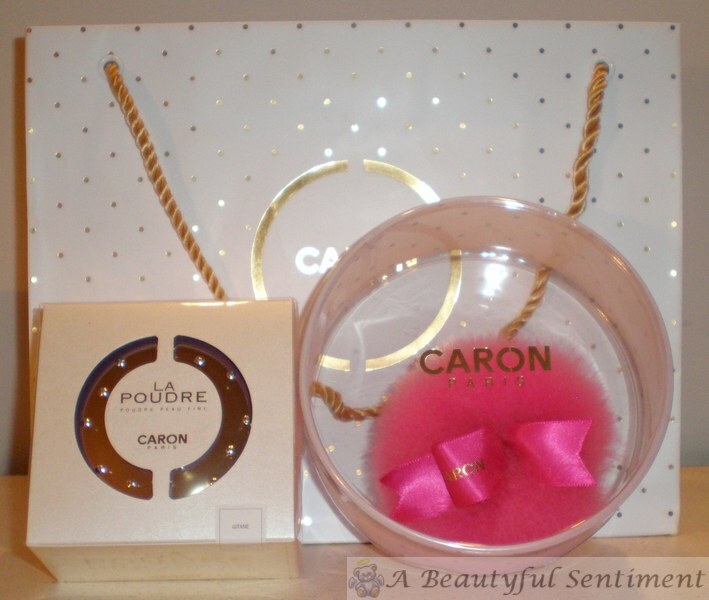 ~Venitienne Loose Powder-this finely milled pink powder with tiny reflective gold bits and Caron’s classic Bulgarian rose scent is a best seller and absolutely gorgeous, especially for an evening out. 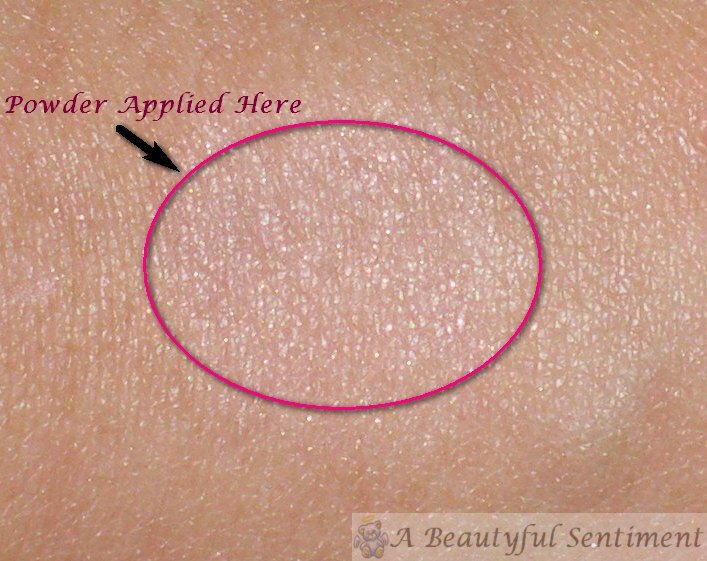 Plus it’s sheer enough that it will flatter any and all skintones. ~If you’re like me and like a powder with a good amount of coverage, check out Caron’s classic full coverage powders. ~And last but certainly not least, a loose powder compact to travel with. 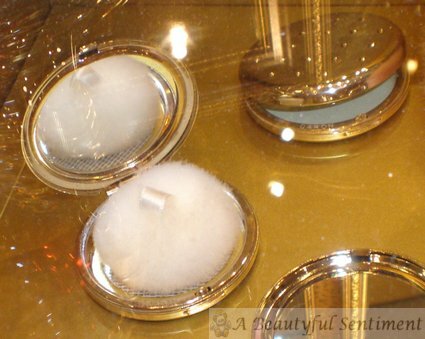 These petite golden compacts come equipped with a dainty white swansdown puff, ready to be filled and toted around. Check out photos of the Caron boutique here–they’re not to be missed it’s seriously stunning! 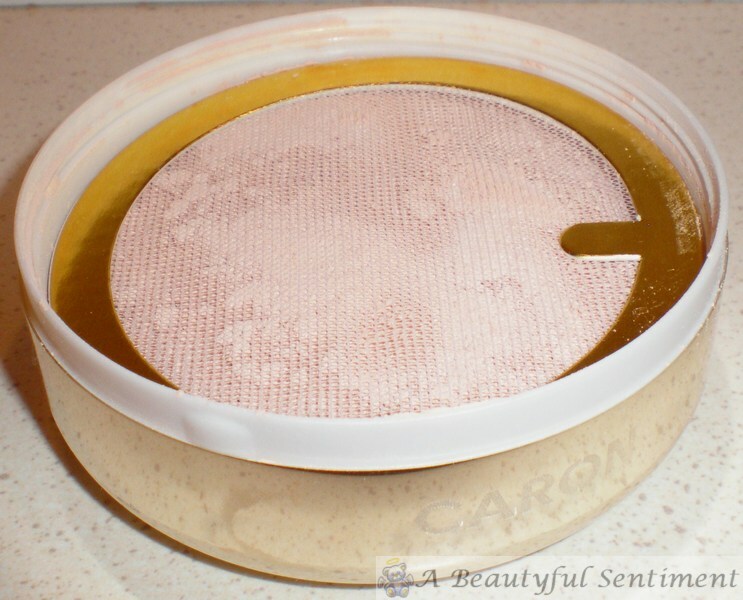 Learn more about Caron’s powders and read my review of their full coverage powder here. 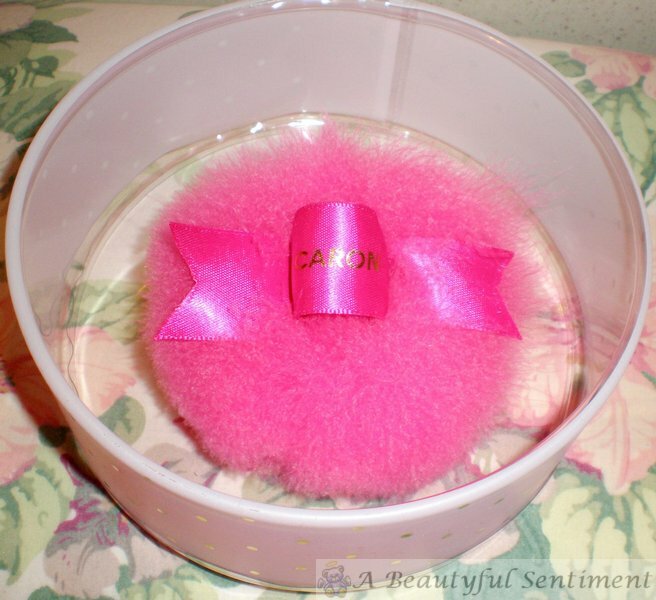 See more photos of my fuchsia swansdown puff and read a review here. 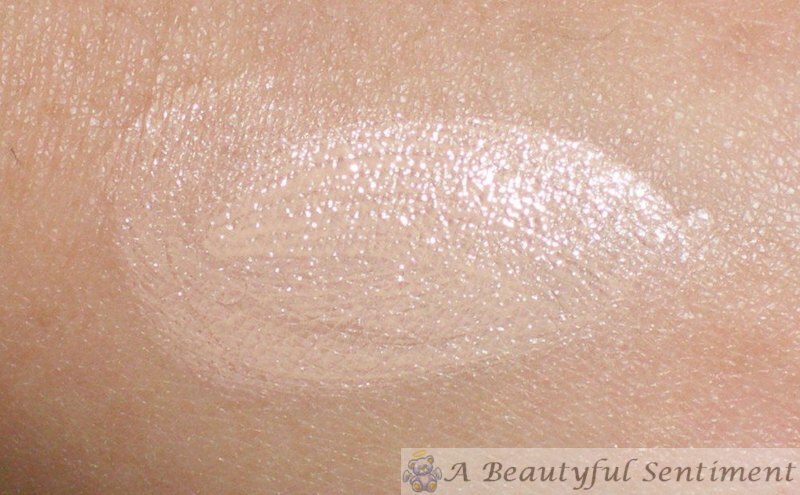 See swatches of Venitienne, Caron’s foundation and other odds and ends here. Caron Poudre Libre Classique Review and a Video! Everything that comes in that magical little box. Years ago, Caron invented a unique world-class manufacturing process for its powders. Natural ingredients are ground, blended and sifted several times to achieve an outstandingly fine, lightweight texture. 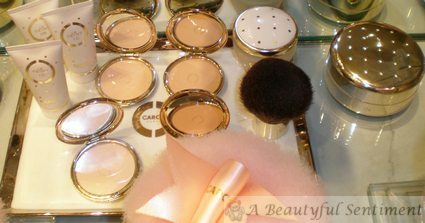 Developed in a state-of-the-art workshop, Caron face powder is recommended by dermatologists, chosen by the most discerning women and used by professional make-up artists for its long-lasting effects. It is sweetly scented with the fragrance of natural Bulgarian Rose, distilled by the in-house perfumer. “Classic,” the formula that gave Caron face powder its legendary reputation, provides excellent coverage and a unifying, mattifying finish for normal or combination skin. It is ideal fora sophisticated, natural “powdered” look. Such a lovely sifter…clumps begone! For reference I’m MAC NW 15-20ish, and Gitane works rather perfectly for my skintone. After typing up that little blurb above for you guys I feel like there’s nothing really left for me to say about this powder! It’s beautifully finely milled and oh so light, and no matter how much of this stuff I apply to my face I can hardly tell that it’s there. While this powder can be used similarly to a mineral foundation since it can provide anywhere from light to medium coverage, I still prefer to use Gitane as a finishing powder simply because I love the look of a flawless complexion and I have stubborn redness in my cheeks. And Gitane really does work wonders for making my skin look absolutely perfect-even, smooth, and soft. Plus after powdering up with my Caron products, I smell great to boot! I will say that for those of you with very very dry complexions, Caron’s classic formulations may dry your skin out a tad as they are “powdery,” but their Translucent formulas would probably be perfect for you! So rather than go into a long spiel about how this stuff is meant to be applied using Caron’s swansdown puff (Diane kindly explained the whole process to me multiple times), I’ve made a (not so great) video showing the whole process. Please don’t laugh this is the first time I’ve attempted to edit a video, and I did the best that I could! 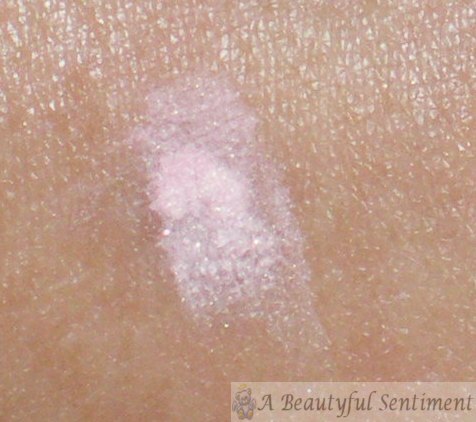 See my review of Caron’s Powder Base, Foundation, and Venitienne Powder here. 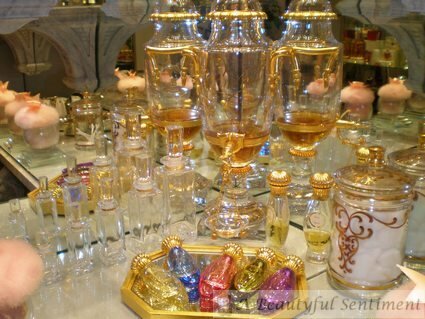 Check out the heavenly photos from my Caron boutique visit here. Read my review of the wonderful fluffy downiness that is Caron’s swansdown puffs here. 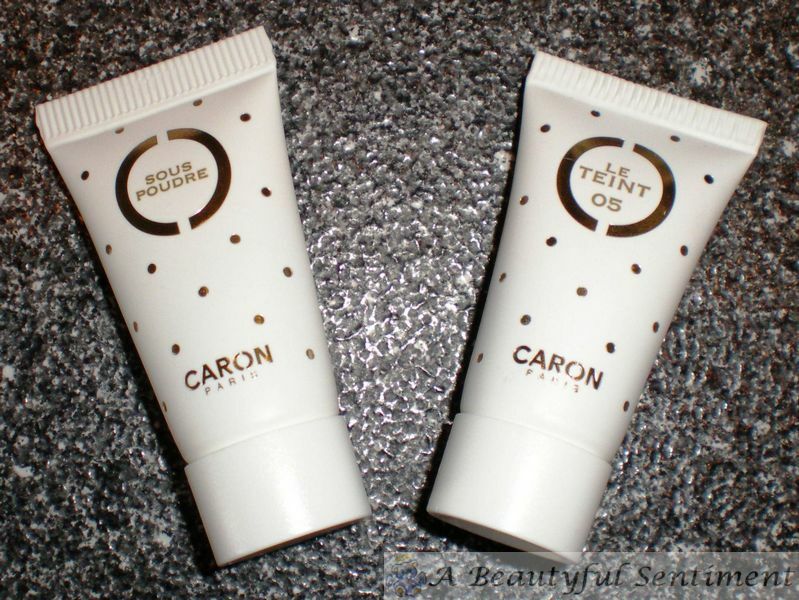 Souse Poudre: Caron‘s Sous Poudre/Powder Base is a light white-hued cream-textured primer of sorts. It mattifies and smooths out the complexion while helping Caron’s powders to adhere better to the skin for a more flawless finish. I really enjoyed the smooth and silky feel of this-it glided beautifully over my skin and left a slightly dewy finish without the feel of silicone. Click over to this post and you can see the beautiful jar that it comes in the fifth photo down: it’s the jar with the white top way in the back on the right. At $45 I’d say it’s rather decently priced and may have to be a holiday indulgence for me. 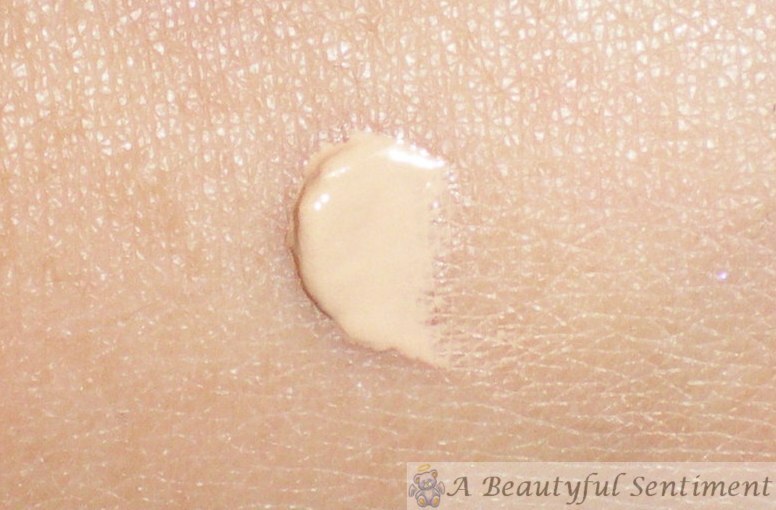 Le Teint: When Diane gave me a sample of Caron’s foundation to test out, I honestly wasn’t expecting to like it at all as I’d never really heard much about them and I tend to be rather particular about my foundations. But color me impressed! Caron‘s Le Teint foundation has an ultra-light, whipped consistency that glides beautifully over the skin (especially with the Souse Poudre underneath), creating a light to medium veil of color that’s perfect for those days when you’re not looking for heavy coverage. I’d say it has the coverage of a tinted moisturizer or a light foundation, although I definitely found that I was able to build more coverage where necessary. It dries to an almost powder finish and is absolutely lovely. This may be another Christmas wish-list item for me! A dab of Le Teint. Spread out a little-see how light the texture is? Caron Poudre Peau Fine in Venitienne: As this is one of Caron’s best-sellers, I couldn’t leave without asking for a small sample to test out! Venitienne is a finely milled pink powder with tiny reflective gold bits and Caron’s classic Bulgarian rose scent that makes a rather amazing finishing powder for evening. The pink essentially disappears into your skin, leaving you with a brightened, glowing complexion akin to the effect of La Mer’s Tranlucent powder. I was a little intimidated by just how pink this looked in the sifter, but it’s really something special on and I feel like I may need a full-sized version. Check out Nicole‘s Caron haul below! Caron overload! She got loose powder in Gitane, a travel loose powder compact, kabuki brush, and a peach swansdown puff plus lots of samples! 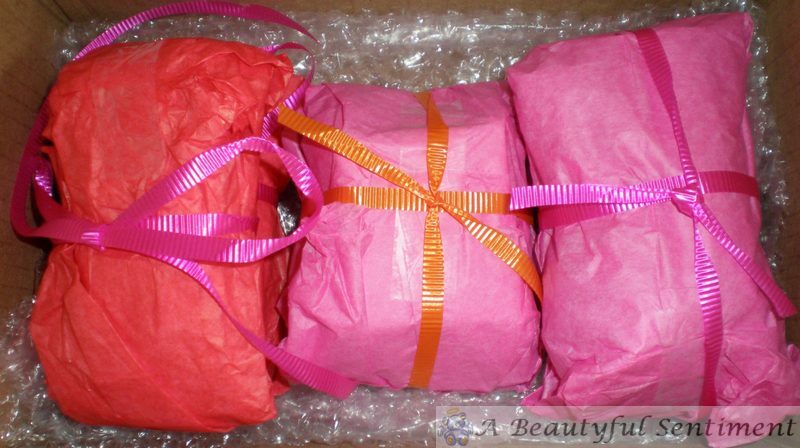 AND…Nicole also sent me along some great lush stuff! Now greedy little monster that I am I tore into the package and used most of the items before I got to photograph them (which may or may not be why the shampoo bar below looks a little loved) but I grabbed what was in my room and took a photo for you! There was so much more good stuff in there! I’m one of those annoying shoppers that has perpetual buyer’s remorse. You know the one: that friend you have who’s always saying, “Maybe I shouldn’t have bought this,” or “Do you really like it or just like it like it?” But for the first time I’ve splurged on something that I don’t feel the slightest bit guilty about–my very own magenta swan’s down puff! At $45 a puff I’ll admit that these are rather pricey, but can you really put a price on pure luxury? 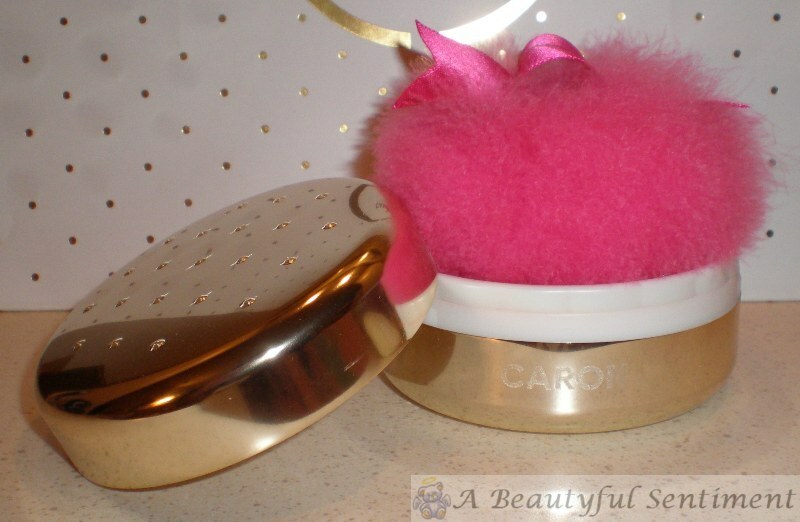 Caron’s swan/goose down puffs are simply divine: featherlight, soft and fluffy as a cloud and absolutely perfect for loose powder application. I admit it–I’m deep in puff love! The fluffy down fibers pick up and deposit the optimal amount of powder, making for no-mess powder application. Unlike a traditional powder puff which can drop your powder or create messy and wasteful powder clouds, the swandsdown puff grabs onto the powder and holds it until you’re ready to pat the powder onto your skin. I was pretty amazed to see that after patting at my skin with the swansdown puff it came away clean with no residual powder remaining on it. I literally felt like I was patting at my face with a cloud, and my only regret was that I hadn’t purchased one of these sooner! Caron’s swansdown powder puffs are available in a wide array of shades (ranging from peach to magenta to yellow and green) and various sizes. If this fluffy little temptress has captured your heart, call the Caron boutique at 212-308-0270 and ask for Diane (tell her Jen sent you) to get one of your very own! You won’t be sorry! I plan on getting a few more in various colors when my wallet can handle it. After leaving you in suspense for so many hours, it’s finally time to reveal the gorgeous delights that I picked up during my recent Caron visit! I tried not to go too crazy since there’s a lot going on cosmetics-wise this month (MAC’s Manish Arora release, Guerlain’s Midnight Butterfly, Saks’ Friends & Family, and the list goes on and on) but I couldn’t resist a little splurge. So what followed me home? 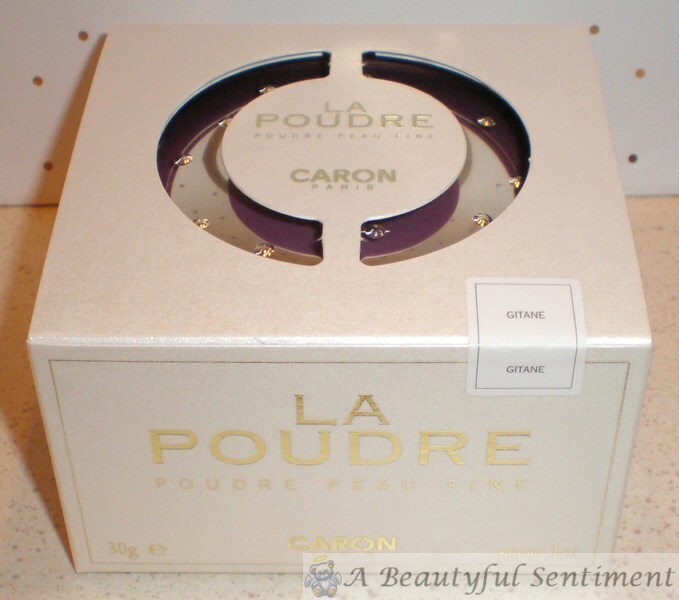 ~Caron’s La Poudre classic face powder in Gitane. The “Classic” formula is what gave Caron powders their legendary reputation, and La Poudre provides full coverage with a matte finish, much like a mineral foundation. I’ll be reviewing this soon so stay tuned for more details! 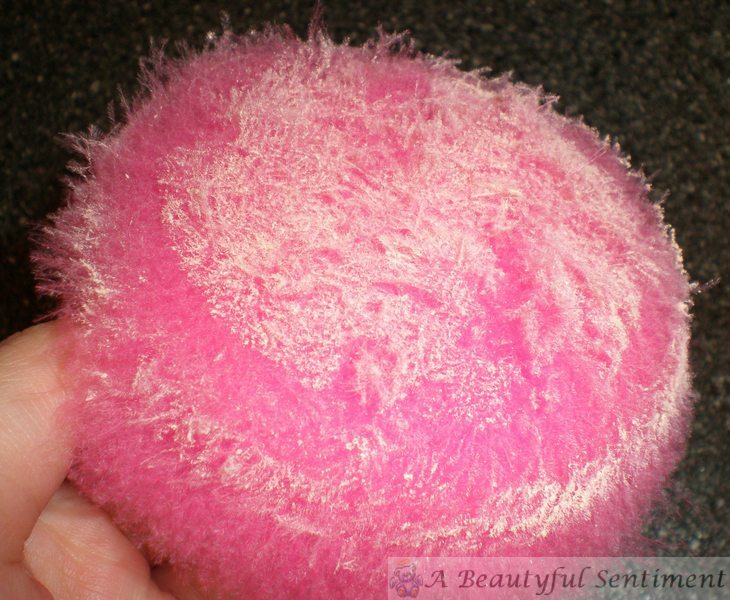 ~Caron genuine swansdown powder puff in magenta. Was there ever any doubt as to what shade I’d get this in? I think not! I’ll be reviewing this soon as well, but let me just say it’s heavenly! 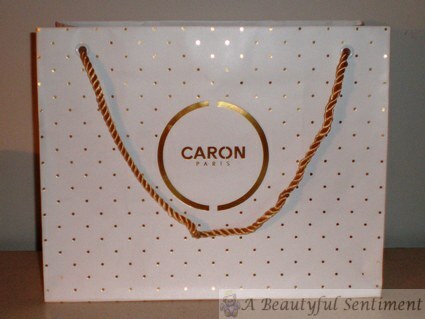 To read more on Caron’s rich history and my wonderful experience at the boutique, click here. Nestled in a cozy corner within Phyto Universe (715 Lexington Avenue), the Caron Paris boutique really is heaven on earth. 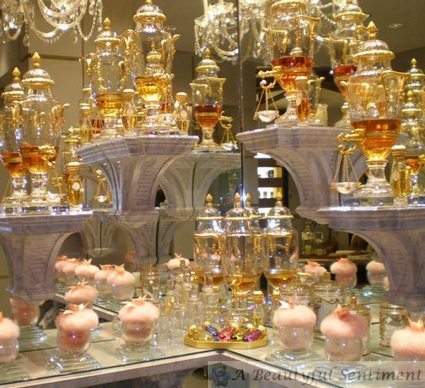 Adorned with elegant Baccarat crystal perfume fountains, goblets of powder, and fluffy swan down powder puffs, the boutique is just impossibly elegant and beautiful. Everything from the decor to the service was sheer perfection–I couldn’t have asked for a more wonderful experience! 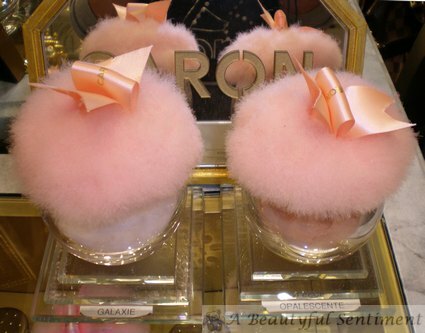 Since 1903 Caron’s fragrances and powders have entranced women with their eye for luxury and their attention to detail. 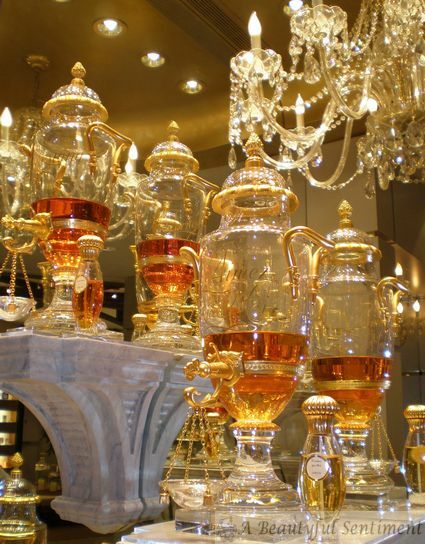 These Baccarat crystal perfume fountains (approximately $25,000 each I believe) contain the most precious of Caron extracts, based on their original formula. Caron powders are purported to be the finest in the world, having been perfected over nearly a century of production. They are composed of of pure minerals (the raw materials for the powders come from Italy) and delicately scented with Bulgarian rose distilled by Caron, meeting the same rigorous standards as the perfumes. Caron’s powders (which come in 19 shades that range from matte and full coverage to sheer and shimmery) are recommended in France by dermatologists and enriched with vitamins A and E, camellia oil and powdered silk, in addition to natural IR and UV filters. 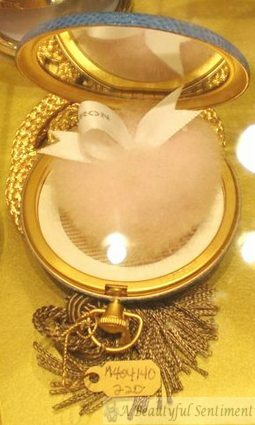 The powder is meant to be pressed firmly into the skin using one of Caron’s heavenly down puffs,and then a dense brush is to be used to dust off any excess. The light-as-air puffs come in a variety of sizes (large which is shown on top of the powder goblets, medium, and mini shown below) and colors (magenta, peachy pink, green, etc.) and are absolutely divine–but more on these in a future post! 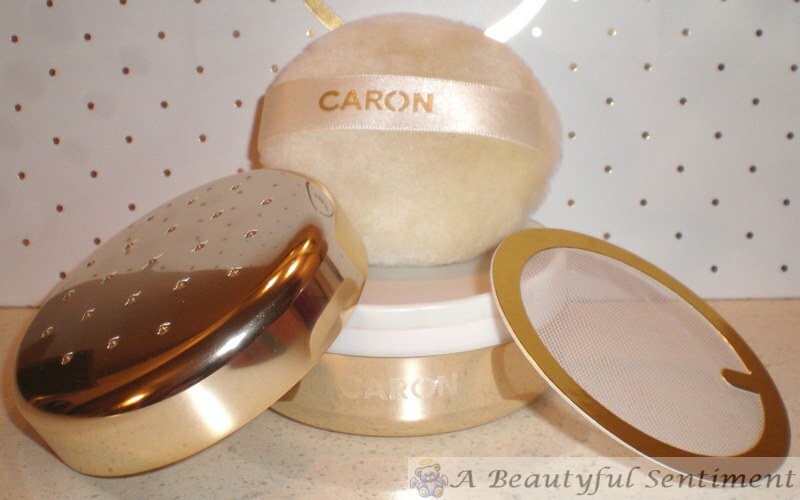 A beautiful Caron loose powder compact which comes with a mini down puff ($45). When closed it looks like the compact on the far right with the raised dots. A luxurious variation on the loose powder compact, this time with an exotic covering ($220). Call the Caron boutique at 212-308-0270 and ask for Diane for all your Caron needs. She is beyond sweet and helpful! And of course I couldn’t leave the boutique without purchasing a little something (or somethings) for myself, but I’ll leave you to wonder what’s in the bag for now. Expect reviews sometime this week though!